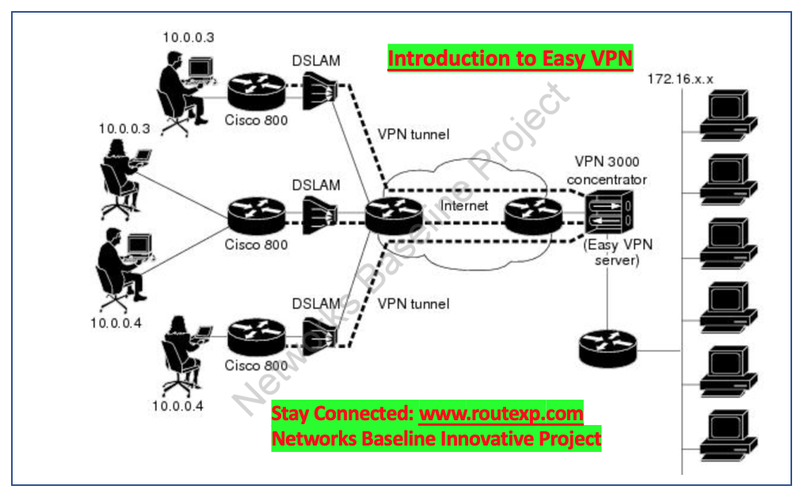 Today I am going to talk about one of the VPN technology and now used many of the enterprises in their network. The VPN technology which we are going to talk about is Easy VPN. What are the various components of Easy VPN ? Easy VPN has three components and these components are Easy VPN Client, Easy VPN Remote, and Easy VPN Server. Easy VPN Remote permits routers and security appliances to establish a site-to-site VPN connection to a Easy VPN Server without complicated remote-side configuration. Cisco Easy VPN Remote is also normally signified to as a hardware client. Easy VPN Server acknowledges connections from Easy VPN Client and Remote, guarantees that those connections have latest policies in place before the connections are established. All Easy VPN Servers are interoperable with all Easy VPN Client and Remote. What are the benefit of Cisco Easy VPN solution ? Consumers that demand to deploy and manage comprehensive site-to-site and remote-access VPNs should consider a Cisco Easy VPN solution because of its oversimplification of VPN management and configuration. Easy VPN upkeeps quality of service (QoS) and multicast, but if there is a necessity to support dynamic routing protocols or direct spoke-to-spoke communications, Dynamic Multipoint VPN (DMVPN) as the preferred site-to-site VPN solution instead of Easy VPN solution. In short, Easy VPN Simplifies IPsec and remote-site device management through dynamic configuration policy-push and it supports QOS. Configuration and management is the primary goal but only restricted networking descriptions are required. What authentication mechanism does Easy VPN provide ? Easy VPN Remote feature supports a two-stage method for authenticating the remote router to the central concentrator. The first step is Group Level Authentication and is part of the control channel formation. In this first stage, two types of authentication credentials can be used like it can either pre-shared keys or digital certificates. The second authentication step is called Extended Authentication. we will talk about the Extended Authentication in our next article.